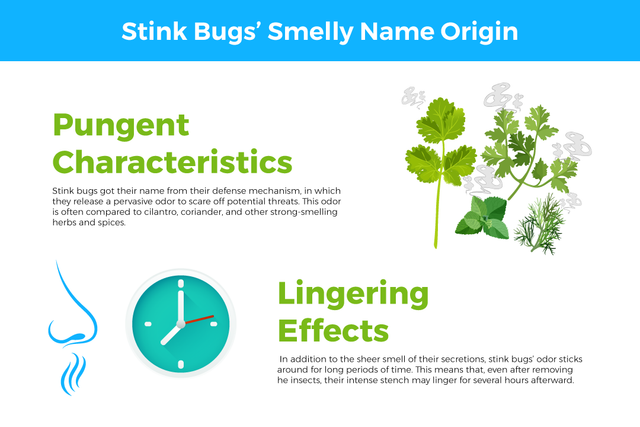 If you catch the scent of something unpleasant in your home, you might not think much of it – until you run across a brown, flat bug and realize you have a stink bug infestation on your hands. Don’t let these pests take refuge under your roof this winter. Connor’s Pest Control can help prevent stink bugs from hibernating in your Maryland home by keeping you informed of the signs and threats of an infestation, as well as providing prevention tips. Stink bugs are large and oval-shaped bugs with bodies that might remind you of a shield. There are a few different types, but the most common ones in Maryland are brown and green. When the bugs reach adulthood, they can measure up to two centimeters long. The insect’s width is almost the same as its length. The brown marmorated stink bug has light bands on its antennae and dark bands on the wings. Once the bugs become adults, they are able to fly skillfully, which is not a comforting thought for many of us. They then fold their wings across the top of their body when they decide to land. These pests like to enter structures here in Maryland during the state’s cold, snowy winter months – it’s their way of escaping the freezing conditions. The abundance of greenery in the area attracts them throughout the other seasons of the year since the insects like to make a meal of leaves, flowers, and gardens. In many cases, the first sign of a stink bug infestation is a mass invasion during the fall. If you come across a bunch of them on your property, this indicates that you’re at risk of an infestation. Finding large numbers of live or dead ones is another sign. Since these bugs are brown, green, and sometimes gray, they can be tough to spot, but the pests often materialize on the sunny sides of structures to enjoy the sun, so look for them there. What Are the Dangers of a Stink Bug Infestation? Stink bugs aren’t a pest that will damage a structure, but when they infest in large numbers, they can stink up your home – and make you quite uncomfortable. If you have a yard or a garden, you may discover you have an infestation because your vegetation is damaged. Stink bugs start to look for overwintering places during the late fall before cold weather arrives – which could mean the walls, crawlspaces, or attic of your home or business. Then, they enter a state of diapause, or the bug version of hibernation. However, entering this phase may not be the end of their active time. If the weather warms up for a long enough period, the bugs might think it’s time for them to wake up and become active, thus escalating the infestation. When spring arrives, the bugs awaken and begin their springtime activities, such as eating your plants and reproducing. With the potential of spreading throughout the country, stink bugs are a big risk to the agricultural industry, considering they destroy crops. They will eat ornamental plants, gardens, and fruit trees in residential and business areas. Keep in mind, though, that they don’t cause structural damage nor spread do they diseases, making them more of a nuisance than a threat to people. Winter brings the biggest risk of a stink bug infestation. Prevent their entry by sealing cracks around doors, windows, and siding. Be thorough and check for cracks underneath any wood fascia, behind the chimney, and around any other openings that you come across. The bugs can get in through electrical outlets, light switches, and even the edges of skylights. When sealing your home against pests, be sure to use high-quality silicone or a silicone-latex caulk. If you have a screen door that is damaged or a window that needs to be replaced, fix them before the cold weather arrives. Stink bugs are attracted to light, so consider changing the outside lights on your home to bulbs that are less attractive like sodium vapor lights or yellow bulbs. 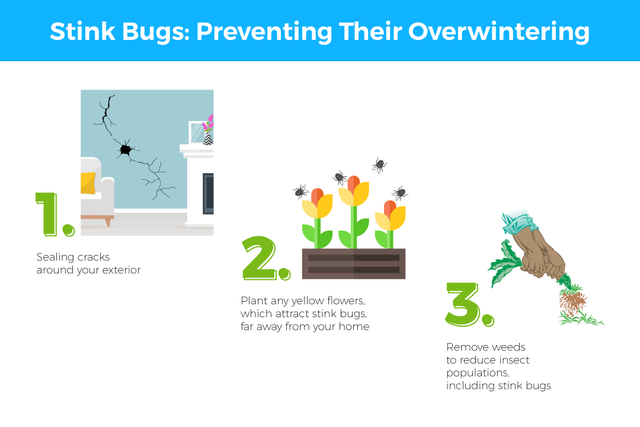 Give stink bugs somewhere else to congregate – somewhere that’s away from your garden, flowerbeds, and home. The pests are attracted to the color yellow, so consider planting sunflowers, mustard, or garlic as far away from your home and garden as possible. This measure could attract the pest’s predators, taking care of your insect problem the way nature intended. Keeping your exterior areas clean and free of weeds will also help control stink bugs. The pests gravitate toward wild, unattended spaces. Weeding may reduce the number of insects you have hanging around without using pesticides. Should You Call a Pest Control Professional? While there are some DIY solutions for alleviating a stink bug infestation, it’s always best to call in professionals for the most effective solution. When you contact our experts, we will be able to provide a large-scale strategy. 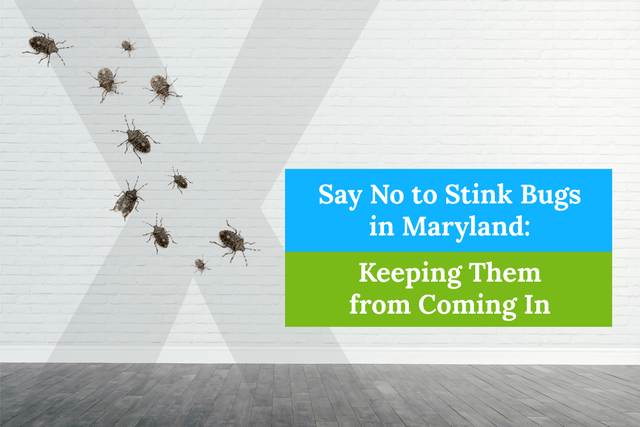 Don’t let your Maryland home or business be overtaken by the smell that this bug can emit. Our pest control experts can identify possible stink bug entry points and use professional-grade treatments to take care of them. If you suspect that you have an infestation, contact Connor’s Pest Control today.